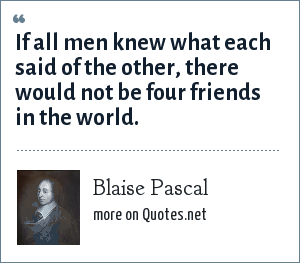 Blaise Pascal: If all men knew what each said of the other, there would not be four friends in the world. "Blaise Pascal Quotes." Quotes.net. STANDS4 LLC, 2019. Web. 23 Apr. 2019. <https://www.quotes.net/quote/41933>.